DrupalCamp Colorado 2016 is in downtown Denver on the Auraria Campus. 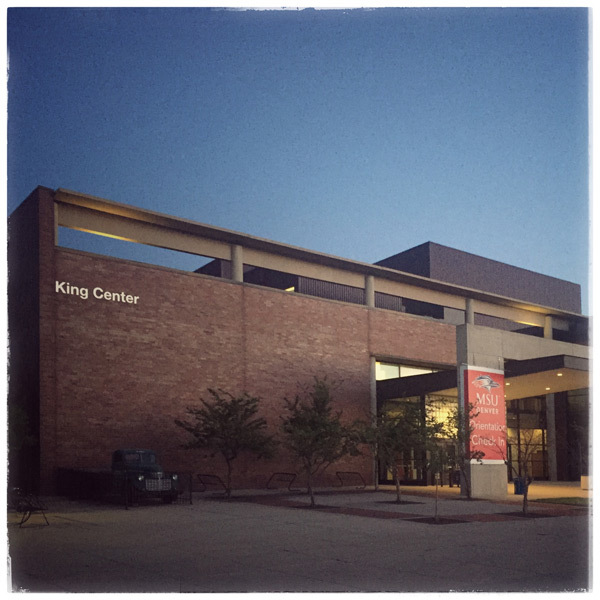 All sessions take place in the King Center of the Auraria Higher Education Center, 855 Lawrence Way, Denver, CO.
Getting from Denver International Airport to downtown Denver is easy. Just take the A Train from DIA to Union Station and you're a few minutes walk from the venue. Union Station is convenient for many modes of mass transit with both bus and light rail stations departing frequently. You can use the above Google map to get directions from your home, then select "bus" mode to see options and schedule. RTD Denver has more details on public transport. Ride your bike! The platte and Cherry Creek trails will both get you right near the campus from miles around. Also, there is a B-Cycle stations near King Center, Union Station, and throughout Denver if you'd like to rent a bike. Recommended free visitor parking is in the Tivoli Lot at Ninth Street and Auraria Parkway located directly west of the Tivoli Student Union or the Parking and Transportation Centre. Being so close to downtown Denver there are many nearby hotels.